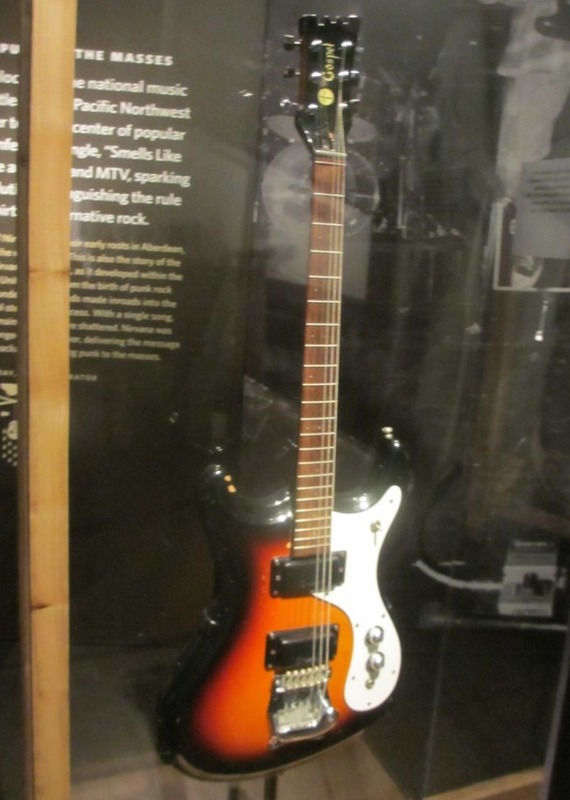 In some ways, the EMP Museum’s Nirvana: Taking Punk To The Masses exhibit is nearly perfect. The lovingly curated exhibit tells the story of Nirvana, briefly touching on Kurt Cobain’s high school years, then documenting the band’s early years and each wave of success that followed, leading to worldwide fame and Kurt’s tragic suicide. The band’s story is told through original photographs and artwork, band posters, vinyl records and cassettes, clothing and a surprising number of actual instruments played by band members. There are multimedia video presentations throughout, providing valuable insight with important key figures. The EMP Museum, also known as the Experience Music Project, is located in downtown Seattle at Seattle Center. The dichotomy of the band’s music, chaos and destruction along with beauty and serenity, all at the same time, are what made Nirvana unique. Sure, many rock bands before and after can make similar claims, but Nirvana captured a sense of alienation that struck a chord with America’s youth. Their breakthrough album Nevermind, and especially its lead single “Smells Like Teen Spirit”, created a sense of urgency and excitement not seen since the Beatles breakthrough. With the feverish success of Nevermind, polished and radio-friendly yet seething with frustration and dissatisfaction, Nirvana did effectively bring punk to the masses, exposing millions of young people to music that they otherwise would not have heard. 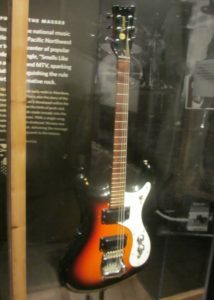 Mosrite Gospel guitar as played by Kurt Cobain. The exhibit begins with three wall-size images of singer Kurt Cobain, drummer Dave Grohl and bassist Krist Novoselic, all captured in a live setting. In front of the images are their actual instruments: Novoselic’s Gibson Ripper bass, Grohl’s drum kit and Cobain’s Mosrite Gospel guitar, which was used in key shows, including the April 17, 1991 show when Nirvana first played “Smells Like Teen Spirit” live. In this same entry area is an exhaustive list of contributors to the exhibit, which in itself is quite impressive. The exhibit relies on over 100 oral histories of key figures including producers, engineers, musicians, record executives, friends and family. There is also a note about the ambient soundtrack for the exhibit, “a quadraphonic serial deconstruction of the signature two-bar riff from Nirvana’s ‘Come As You Are’”, designed by producer Steve Fisk. 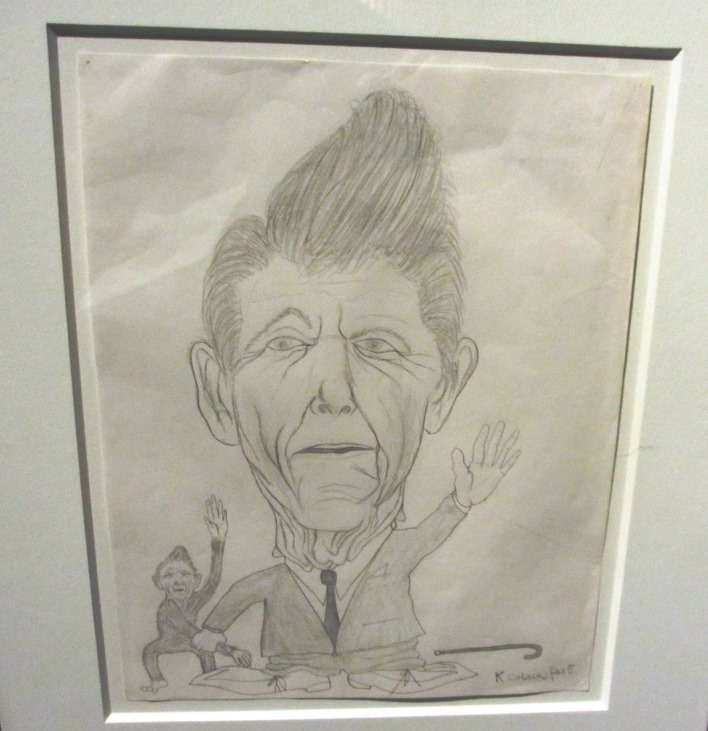 “Untitled (Ronald Reagan)”. Pencil sketch by Kurt Cobain. After the initial entrance there is a display of two pieces of artwork from Kurt’s senior year at Aberdeen’s Weatherwax High School. 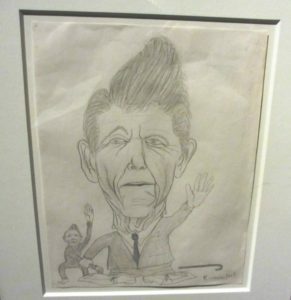 The first is a pencil sketch of Ronald Reagan raising his left arm, while holding hands with a small monkey (also in Reagan’s image) with his right hand. There appears to be a cane to Reagan’s left, perhaps indicating that he is to be dragged off stage, like in the old movies. 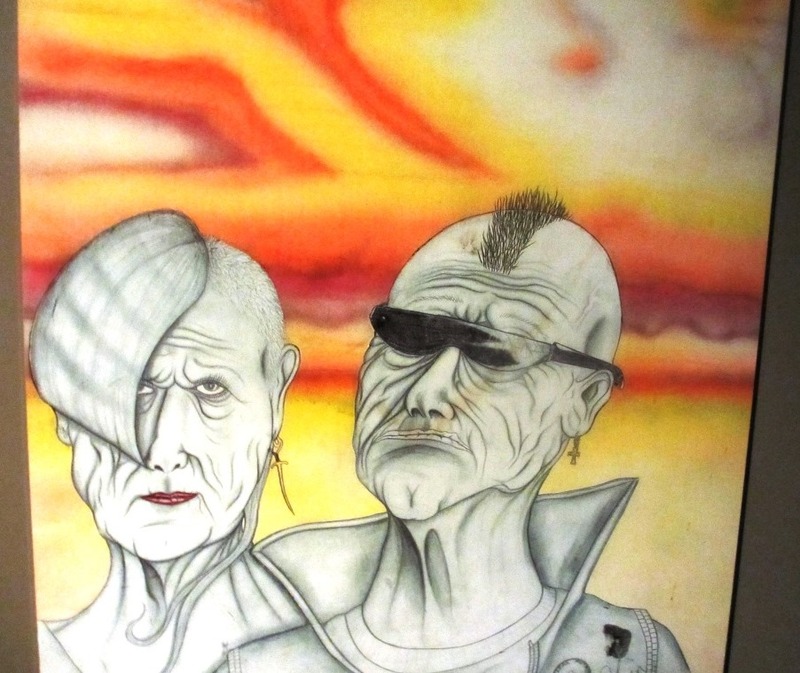 The other artwork, A New American Gothic, shows an elderly punk couple, tattooed and pierced. It’s clearly modeled after the famous painting and pop culture reference American Gothic by Grant Wood, which depicts a stoic farming couple posing in front of their home in rural Iowa. “A New American Gothic” by Kurt Cobain. These early artworks by Kurt are revealing in several ways. They of course show that Kurt already had an aptitude for the arts. The Reagan sketch obviously has a very strong political bent, although it’s up to interpretation what Kurt was trying to convey. The painting of the elderly punk couple is interesting in that it so neatly fits with the exhibit’s theme. It is apparent that Kurt already had a love for punk rock culture and that he already felt himself to be part of it. 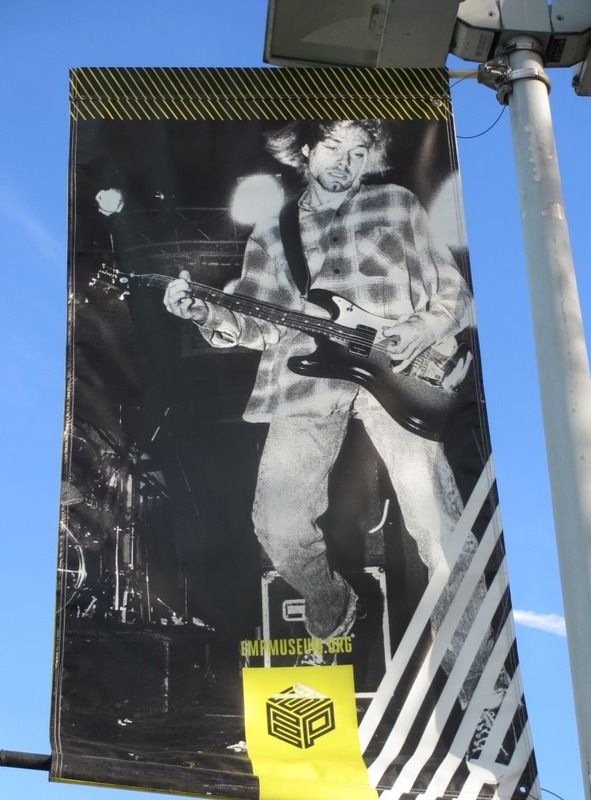 Banner for ‘Nirvana: Taking Punk To The Masses’ exhibit.